If I had to choose the two most important measures to understand how a business is really doing, it would be the two C's: Cash and Customers. By law, every public company in the US must issue a Cash Flow Statement (the Source and Application of Funds Statement) in its Annual Report to show where its cash is coming from and where it is being spent. It cuts through the accounting chicanery that we have become aware of in recent times, and lets us see what is really going on inside the business. It will be some years before companies are required to issue a Customer Flow Statement in their Annual Report because most still don't have a good, reliable system to capture a large share of actual customer spending behavior. At least 75% of sales would probably be the absolute minimum needed to provide shareholders with an insight into customer movement, both into and out of the business. It would certainly tell them how effective management is at providing the right goods and services for the company's marketplace. Fortunately, we don't have to wait until such a customer metric is mandated by law. For those of us with a good customer database, we can start measuring our customer inflows and outflows immediately. One way to do this is using what I call The Bathtub Report. A consultant friend told me recently he recommends it to all of his clients. A major European retailer told me it is the first customer report they look at each month. Its appeal lies in its simplicity. 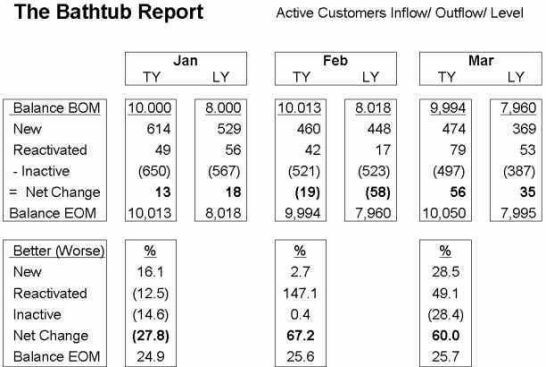 As seen in Figure 1, the Bathtub Report shows the number of active customers at the beginning of the month (in this example, all who have purchased at least once in the preceding 3 months), how many are first time customers during the month, how many become reactivated in the month (those who had shopped before but not during any the preceding 3 months), how many became inactive this month (who did not shop in the latest 3 months), and the resultant balance (the number active at the end of the month). The 10,000 active customers listed at the beginning of January had all shopped (purchased something) at least once during October-December. The 49 reactivated customers were those who had last shopped prior to October. The 650 defined as inactive at the end of January were those who had not shopped in the 3 months November-January. As this last group (inactive customers) was included in the active customers total at the beginning of January, it means that their last shopping trip was in October. It follows that the 10,013 customers at the end of January comprises only those who purchased at least once during the 3 months of November-January. A comparison with the same period last year is shown, together with the percentage changes in each component. Three consecutive months of results are shown to give management a feel for trends and, more importantly, changes in trends. Obviously, the component periods should be changed to suit your particular business, as described in Figure 2 (below). For example, companies that report on a 4-weekly (or 4/4/5 weekly) cycle should do likewise when measuring customer flow, rather than using a calendar month. Also, of course, companies who sell infrequently purchased products (such as furniture or jewelry) might define an active customer as one who made a purchase in the past 12 months (rather than 3 months). Purpose: To identify the components that affect your Active Customer total, thereby helping you measure how effective you are in building your customer base. Review Period: This can be weekly, 4-weekly, monthly, or quarterly, depending on the nature of your business and your customer frequency. Inactive Customers: This definition also varies according to the nature of your business. In the example shown, a business with high frequency, a customer was deemed inactive if no purchases were made within the past 3 consecutive months. Averages Per Store: Multi-site businesses should express their customer details as averages per store, both to make the numbers readily understandable and to avoid comparison confusion as stores are opened and closed. What is important is that you adapt the elements of the report to suit your business. The key is to understand whether your number of active customers (average per store) is rising or falling. This is comparable to the water level in a bathtub, which is determined by the water flowing in through the faucet (in business terms, the new and reactivated customers) and the water flowing out of the plug-less bottom (equating to customers who are becoming inactive). And that's why this is known as The Bathtub Report. A company using this report is able not only to measure the changing level of its active customers from period to period but can improve that level by developing programs that improve the component elements: adding new customers, recovering more lost customers, and reducing the customer outflow (by looking after existing customers better). Through a careful analysis of the results of these different programs, a company can readily discover which programs are the most cost-effective in building its active customer total. These, obviously, are where it will concentrate more of its marketing resources. As you will no doubt appreciate, a company armed with a deep understanding of both its cash and customer flows (both in and out) will have a competitive advantage over those who do not. I hope that The Bathtub Report will help move your company into the former group!